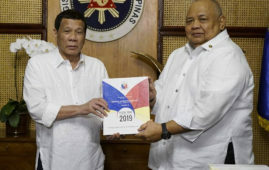 Malacañang on Monday defended the decision of President Rodrigo Duterte to include former Senator Jinggoy Estrada on his list of preferred senatorial candidates for the upcoming May elections. Presidential Spokesperson Salvador Panelo said that the public cannot begrudge the President for endorsing Estrada because he is still presumed innocent despite being accused of plunder in relation to the multi-billion peso “pork barrel” scam. “Number one, Senator Estrada or former Senator Estrada is charged with corruption. And the Constitution says, unless you are convicted by final judgment, you are presumed to be innocent. So the presumption is Estrada is innocent,” Panelo said. Panelo also pointed out that Estrada has been granted bail by the Sandiganbayan Special 5th Division in 2017. “Number two, he’s been granted bail. And the reason for the court’s grant of provisional liberty is anchored on the fact that the evidence of guilt is not strong,” Panelo said. “So you cannot begrudge the President for endorsing a man who is presumed to be innocent under the law; otherwise you are prejudging him,” he added. On Friday, Duterte endorsed Estrada by raising his hand in a speech in Legazpi City. Earlier, the President said he would also endorse Estrada’s half-brother, reelectionist Sen. JV Ejercito. Amid criticism that Duterte is endorsing a plunder-accused candidate despite his stance to fire Cabinet officials involved in even a “whiff” of corruption, Panelo explained that investigation has to run its course. “A whiff of corruption does not mean a reckless receipt of an allegation of corruption and a decision to fire the person subject of that information. The President as a lawyer investigates any allegation of corruption before he makes a move,” Panelo said. “Before he fires people, there’s information that reaches him and he orders an investigation immediately,” he added. Panelo, who is also Chief Presidential Legal Counsel, emphasized that it was “unfair” to presume that a person is guilty unless he or she has been convicted. “In my practice of law, even before joining the government, you cannot be assuming and presuming and spreading the guilt of a person unless he’s been finally convicted,” Panelo said. Panelo insisted that Estrada is not a member of the Cabinet and was accused of plunder when he was a member of the Congress. Meanwhile, Panelo said the President’s endorsement of Estrada will not affect his tough stance versus corruption. “The survey will tell you that the President has made many perceived to be unpopular decisions, and yet the survey remains very high. In other words, Filipino people trust this man. They’re confident and believe in his judgment. 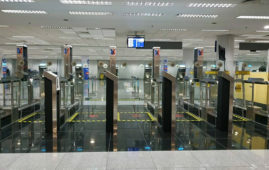 And ultimately, it’s the people who will decide anyway,” Panelo said. With only a day left before the start of the campaign season, Panelo said that the President has yet to release an “administration slate” of candidates. 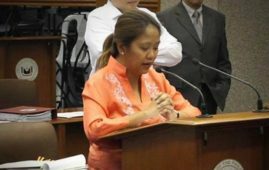 “He (Duterte) has not made any statement on that. Hopefully he will. But until such time, we cannot speculate on whom he will support; except for the names he has already mentioned,” Panelo said. Panelo, however, said that the President will definitely have his “preferred candidates” and will actively campaign for them. 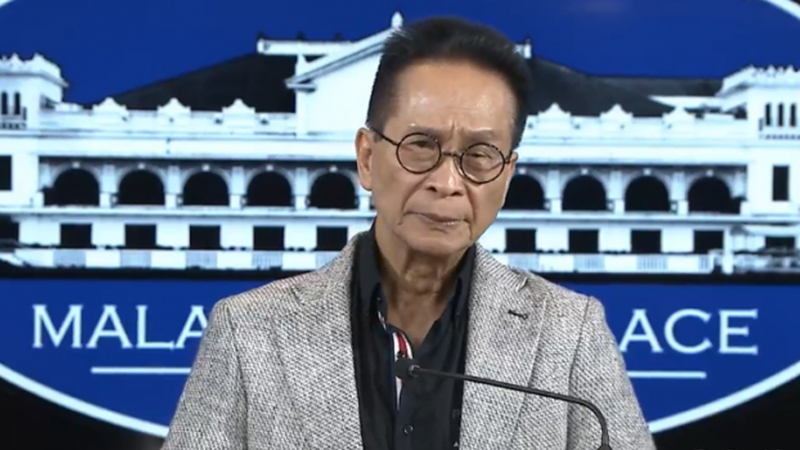 “The President will endorse certain candidates of his choice so presumably he will be actively campaigning since he is not prohibited by law to do so,” Panelo told reporters in an interview after the press briefing. “An endorsement could translate into votes given the popularity of the President but the ultimate judgment will be on the part of the people,” he added. Meanwhile, Panelo said that while President may endorse his preferred candidates, he will never use any government resource in support of or against any candidate. “He said, ‘I will not allow any government fund to be used in support or against any particular candidate,’” Panelo said. Duterte has previously endorsed at least 10 candidates namely former Special Assistant to the President Christopher “Bong” Go, Philippine National Police (PNP) chief and Bureau of Corrections head Rolando “Bato” dela Rosa, and former Presidential Political Affairs Adviser Francis Tolentino.